This is the second odd sparse tree that we've seen around the island. The fact that we're leaving here in a month has been running through my head since I wrote it in yesterday's post, over and over again. When we see these blue bags on the banana trees we know this is a banana farm. They don't use pesticides instead using these blue bags to keep the insects off the bananas. The first time we saw the blue bags was the day we arrived in Belize, many moons ago. The preparations for leaving, the packing, dropping off the rental car, the possible overweight luggage and the other annoyances of departure keep flooding my brain. The steep stairways with railings are placed throughout the island to allow pedestrians to get "up" to the next street. I tell myself to stop thinking of this. Let me revel in our remaining time in Madeira with the same peace and ease we've both enjoyed during the past month and a half since we arrived. It's interesting to see plants and trees we've never seen in other countries. ﻿As hard as I try, the thoughts continue to waft around my head. Projecting into the future is not always a good thing. Planning for the future is. That, we have covered. The low lying clouds always create an attractive scene. Whenever I feel a bit of angst, I immediately start thinking of what I can do to relieve the uncomfortable sensation. Today, I keep asking myself, "What is this really about?" As I write this now ("they" say writing is therapeutic) I realize it has something to do with the packing, more than anything else. My overweight luggage. That's it. Lately, its been cloudy several days a week which we don't mind when the scenery remains beautiful in any weather. The solution is clear. This week, in an effort to avoid procrastinating, I hereby promise myself to go upstairs and start making a new pile to be donated to a charity in Madeira. I still have items that remain, unused, unnecessary. Why do I hesitate to let them go? When we picked up our box of "stuff" at customs in Funchal weeks ago, it contained replacement clothing items for me; two pairs of jeans (one to be cut into capri length, another to be cut into shorts), three long skirts (can be worn to dinner in the somewhat dressy dining rooms on the two upcoming cruises), three plain tee shirts and one pair of comfy white leather Keds to replace the worn out pair I now wear everyday. The decorations in the streets was in preparation of an upcoming annual "beach party." When we saw these decorations we thought it was for an upcoming wedding. With the language barrier, it wasn't as simple as asking. This morning, while dressing I looked in the closet of my "dressing room" (an extra bedroom in the house) seeing many items that need to go. The sooner I do this, the more chance I'll have of ridding myself of these annoying thoughts. Only one neighborhood was decorated. We assumed it was a private celebration. Generally, I'm not a procrastinator. If there's a task to be done, I do it. I rationalize that these past weeks have been very busy booking vacation homes into the future which has basically taken most of the day when we aren't writing here or out exploring. Brilliant color as still some flowers continue to bloom. We've yet to find a vacation home in New Zealand and must continue the search. We'll be there in a mere 18 months. The problem appears as a result of high prices and to our surprise, the number of property manager's that don't reply to inquiries, something we've never experienced in the past. These two tasks on hand, both of which are daunting to me, must be accomplished soon to free my thoughts which will ultimately add to my ability to enjoy our remaining time on this lovely island. An appealing entrance to a house in our neighborhood. OK. The world has seen my commitment, in writing, of the intent to accomplish these two tasks within a week. With a plan in mind, I find myself on the road to "mental freedom" looking forward to reporting back that these tasks are accomplished, the sooner the better. ﻿Now I have to hang today's load of laundry outdoors, do some chopping and dicing for dinner, and hopefully run upstairs and make the first pile of items for which I'm willing to say "goodbye. "﻿﻿﻿﻿After that, both of us will be back online searching for a home in New Zealand. This video was from the church bells ringing from the church bell tower across the way from us while we lived in Boveglio, Italy. (Having no video taking experience to speak of, it was jittery). It rang the longest on Saturday evenings at 6:00 pm in preparation for Saturday mass. For details from that day, please click here. The living room is always a crucial area for us for relaxing and enjoying the view. There's no shortage of either in this wonderful location. Another angle of the main living area. We're excited as we enter these two firmed up locations to our ever growing itinerary which, by the way, we'll be posting in its entirety once we firm up a place in New Zealand. Once we settle the details of a new booking there are many steps to enter it into our Excel spreadsheet with many tabs. One worksheet in our spreadsheet is the "Itinerary and Costs" tab whereby we enter information into columns; the dates, location, rental amount, car rental, transportation, entertainment, dining out, groceries, tips and fees. and miscellaneous. Although the ocean views are at a distance, we're looking forward to amazing sunsets. With a pool on the 3 acre property, we'll be content this far from the ocean. Rental cars are affordable in this area and we can easily drive to a nearby beach to walk along the shore. Another worksheet in the spreadsheet is "Deposits and Balances" which include: dates, location, total rent, hotel or cruise rate, deposit paid, date paid, balance due, date(s) balance due (at times, payable in one or more installments). For cruises, there is an additional worksheet with details of the cruise including dates, name of ship, total cost including tips and taxes (usually paid at time of booking the cruise), cabin number and class, balance due, date due, credits and extras. 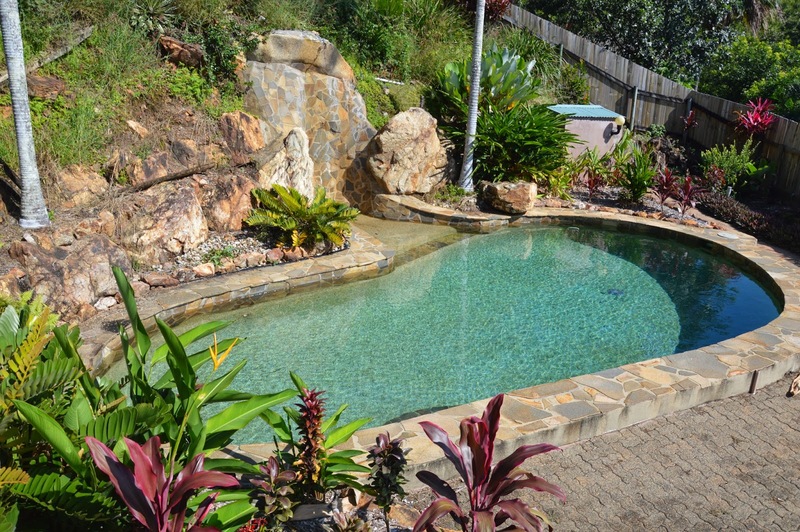 We can hardly wait to lounge by this pool in the backyard. Once these numbers are entered, we make a folder with all documents relative to a particular property, hotel or cruise and save it on our cloud and external hard drive. Without a doubt, there are numerous steps to logging future travels but we've found that this work well. Well equipped kitchen with all we'll need. When a new reader pops into our site, their immediate perception may be, "Cool. These old timers are having the easy life." Little do they realize until reading further that the planning, recording and preparation for our travels is a complex undertaking requiring painstaking effort and diligence. The bedroom with queen bed and doors to patio. Now, let's get into the Trinity Beach, Australia new booking. I must admit, this was one of the most difficult countries/continents in which we've searched thus far. Prices were high, especially with ocean views. It was impossible to find something affordable located directly on the beach that was nice enough for our liking. We aren't willing to live in a dumpy little house, even for a view. In the end we compromised in a few ways; one, the ocean view is at a distance but a beach is nearby; two, we're renting an full windowed/glass door home with private access on the ground level "situated on 3 acres of tropical rain forest with 180˚ views of the Coral Sea and Cairns beautiful northern beaches." 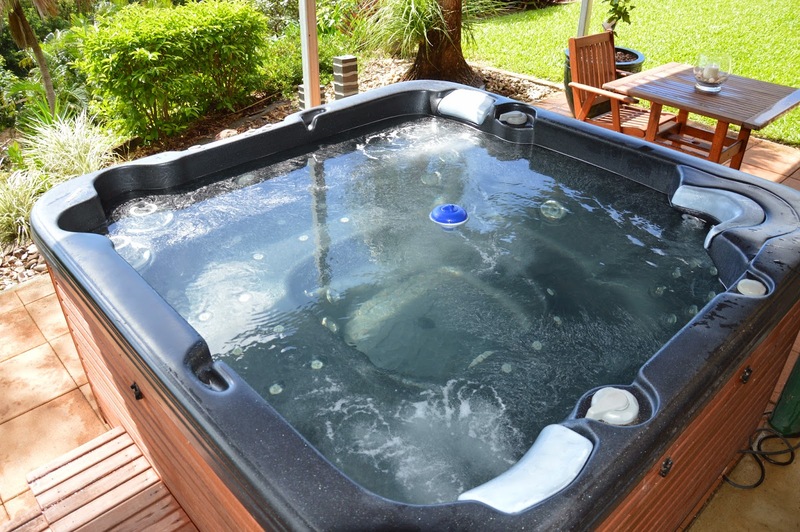 This hot tub will be used frequently. How could we resist? Certainly, it's more private than a condo or apartment and with full access to the grounds and pool, we'll be totally at ease. The owners although younger than us, live in a separate property on the grounds and are still working and gone most of the day. 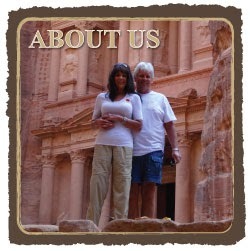 They are well traveled, outgoing, warm and friendly. Most likely, we'll all become friends! Roomy shower compared to many smaller showers we'd had in the past. We couldn't be more thrilled to have this wrapped up. 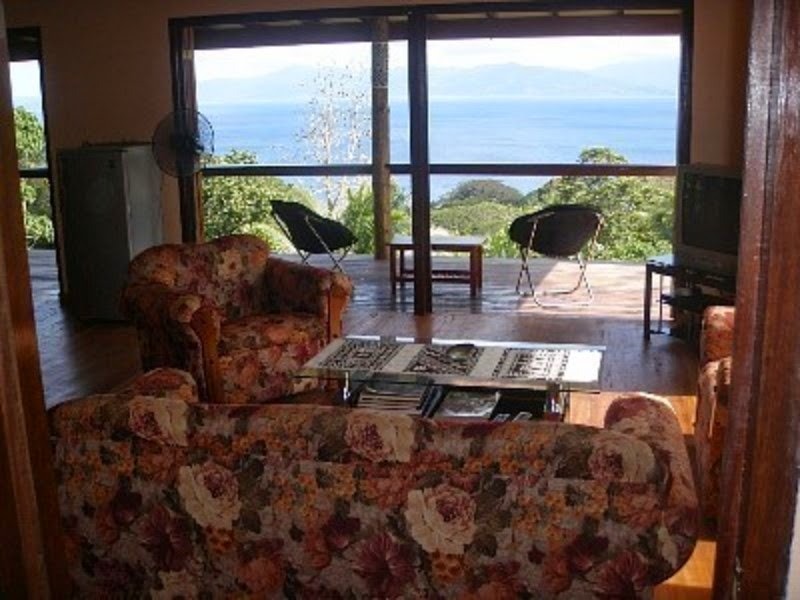 Now, between this property and Fiji following, we are currently booked out until December 6, 2015. Over the next few months we'll continue booking out another six months in order to have bookings through June 2016, almost two years. Then, we can relax (so to speak) for a year .living in the moment. The rain forest setting should bring us some visitors! I must admit, it's hard to believe that we'll be in Paris in 32 days. How did this come up so quickly? For now, we continue to stay in tuned with our remaining time and surroundings here on the beautiful island of Madeira, Portugal. Have a warm and sunny weekend! This was the veranda where we hung laundry in Boveglo, Italy. This was the second country in which there was no clothes dryer available to us, the first being United Arab Emirates where we stayed in Dubai for 13 nights the prior month. Now here in Madeira we use such a drying rack which frequently tips over in the strong winds. For details from that date, please click here. View overlooking the resort to the sea. 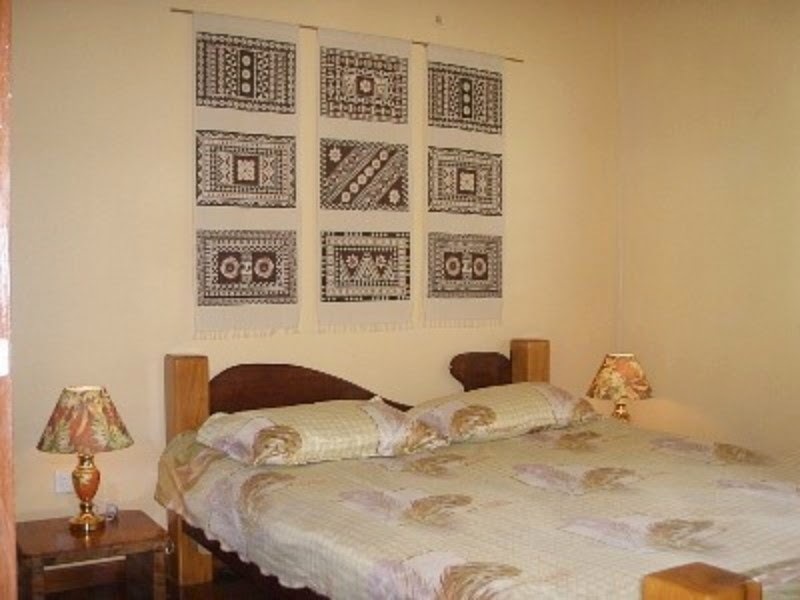 Due to the necessity of resizing the photos on the resort's site, these photos are a bit blurry. To see details, please click here for the Homeaway listing. With strict 90 day visa requirements in Australia, we had to make a plan to spend more time outside of Australia. Rather than fly in and out of the continent to have a chance to start another 90 day period, we decided that living in another country in South Pacific for yet another 89 days makes the most sense. This way we can return to Australia to begin another 90 day visa. The veranda at our private villa, an actual separate house. We'll be able to purchase a one year visa online, still requiring us to stay only 90 days at a time, that will allow us to go in and out of Australia with greater ease over a period of one year. Long ago, we both expressed an interest in Fiji as we considered living in Australia for varying periods of time. We love island living which in most cases, provides us with close proximity to the sea and of course, the kind of views we can't seem to resist. 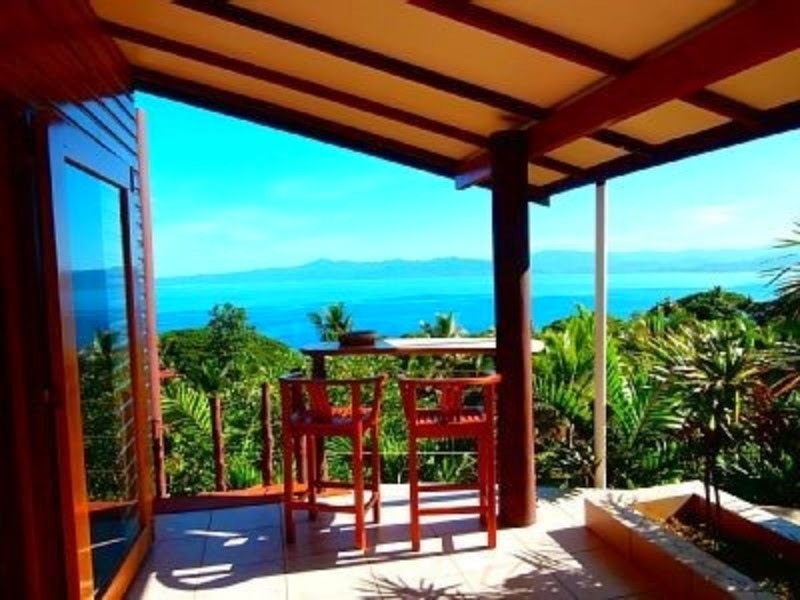 When we originally looked for vacation rentals in Fiji awhile back, we were quickly frustrated by the rates and gave up. With the new booking in Australia, we had a new determination to find something wonderful at an affordable price. Once again "safari luck" kicked in and just like that...we found a fabulous resort that worked out an excellent price for us for half as much as we'd expected to pay. The information we're sharing today isn't sequential for our booking dates. Prior to living in Fiji, we'll be living in Australia for 89 days which information we've yet to share here. 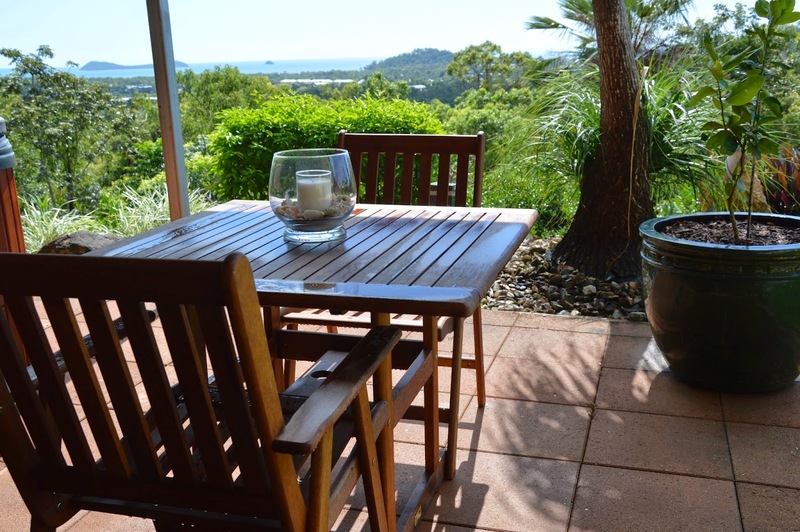 This weekend, the owners of the Australian rental will send us their photos of their lovely property in Trinity Beach, Australia, which we'll post the next day. While in Belize, our first vacation rental outside of the US, we lived at the gorgeous Laru Beya resort in Placencia, loving every moment with our condo unit directly on the ocean on ground level. From the attentive staff, included cleaning and laundry twice weekly, to the infinity pool, restaurant and bar, it was ideal. Most of all, we made wonderful friends with whom we've stayed in touch. 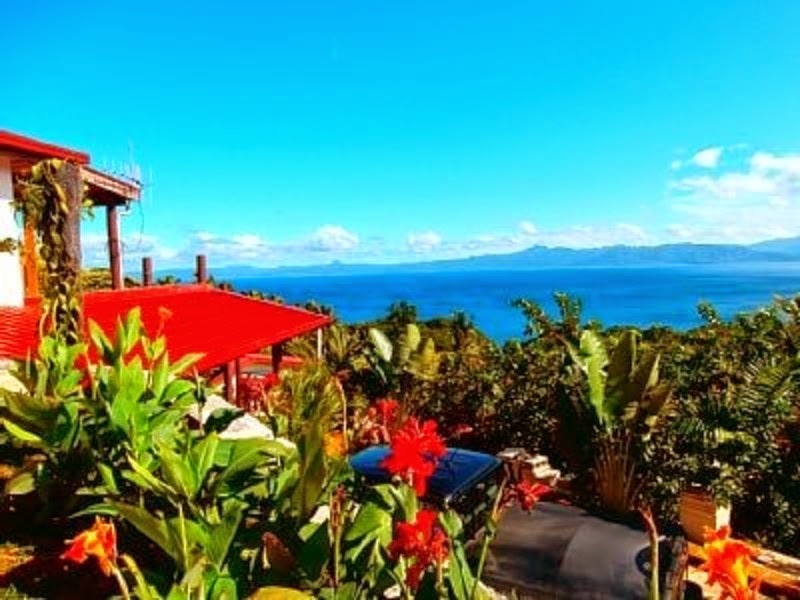 We'll be living on the island of Vanua Levu in the village of Savusavu which is situated above the main island of Fiji, away from the bulk of the tourist hubbub on the main island of Fiji. 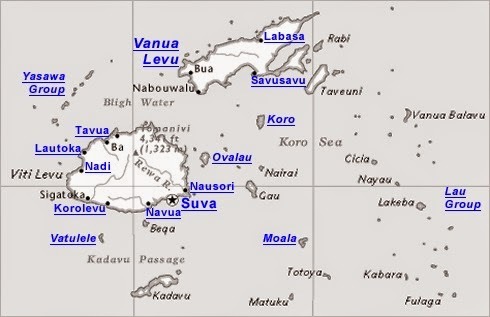 Beginning on September 8, 2015 (day of daughter Tammy's birthday, day after son Greg's) until December 6, 2015 we'll live on an island paradise for a full 89 days, another resort on the remote island of Vanau Levu in the town of Savusavu as shown in this above map. 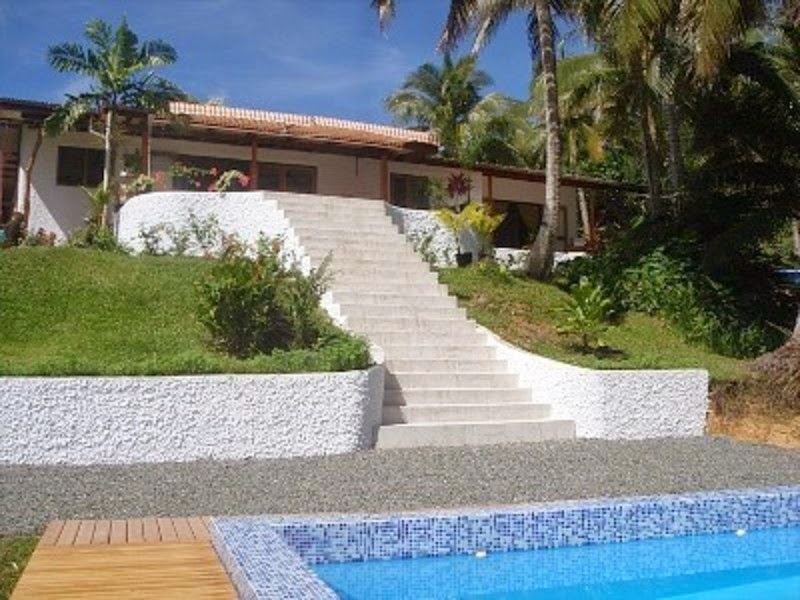 Prior to booking this property, we researched transportation to the somewhat remote island. 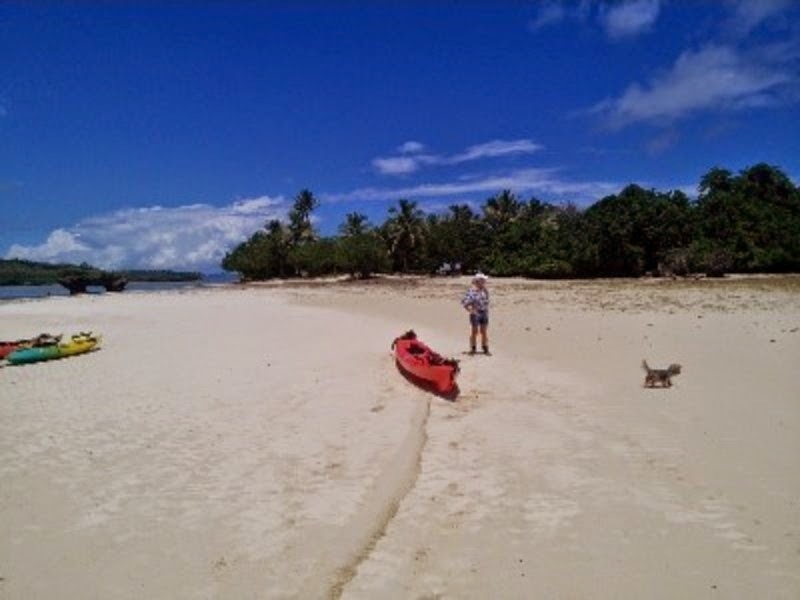 We'll fly from Cairns, Australia, (the closest airport to the rental in Trinity Beach, Australia) for a total of 10 hours to arrive in Vanau Levu. Its a long flight with multiple layovers but considerably less time than many of our previous flights. A portion of the living area. We won't need a car while on the island with a reliable driver (raved about in the reviews) that can easily take us anywhere we'd like to go at a reasonable rate. With the high cost for a rental cars on the remote island for such an extended period, we'll be content to request the driver for dining out, shopping and exploring the island. 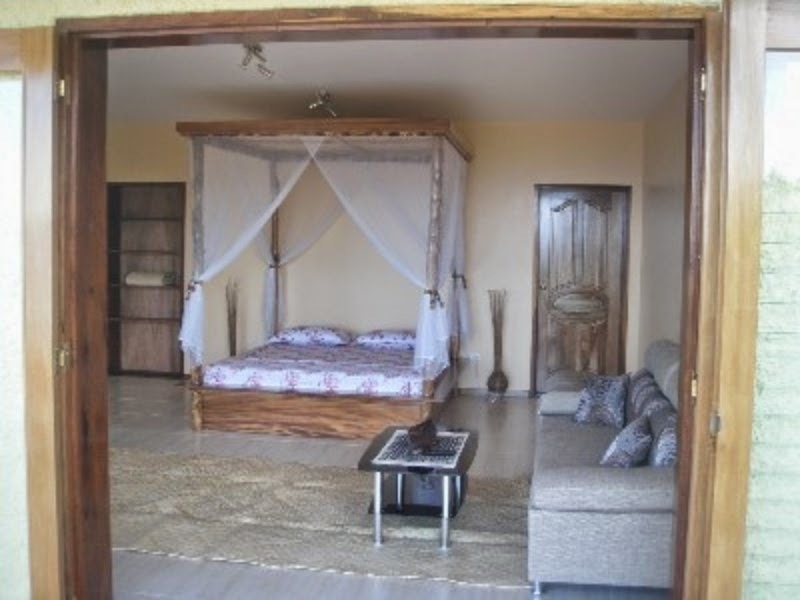 This is an excellent scenario for us, a quiet location directly on the ocean away from the tourist hubbub and yet relatively accessible to fulfil our needs for shopping, dining out and entertainment. This island appears to be comparable to one's vision of "hiding away on a deserted island." We anticipate that staying at this resort will be comparable to those vacations in our old lives, those that we never wanted to end. With 89 days on this island, we'll satisfy that longing, ready to head back to Australia for a short stint and then on to New Zealand. Although, we haven't pinned down the locations yet, we're working on New Zealand now, hoping to wrap it up in the next several days. As with any new booking, there's a bit of trepidation as to whether the property will prove to be as it's described on the website. Our first booking outside of the US in Belize resulted in our staying only a week when there was seldom running water and there were holes in the window screens. Within days of arrival, I had no less than 100 inflamed bites from the no-see-ums (sand flies), getting more and more bites each day. The lack of running water, more than the bites, motivated us to get out of there as quickly as possible. We anticipated that I'd be bitten wherever we went. Although, we lost the money we'd paid when the owner refused to give us a refund, once we moved to Laru Beya Resort we were in heaven. The sand flies were easily manageable by using repellent when outside at night. Luckily, we've been pleased with the diligent and thoughtful representation by all of the subsequent managers/landlords for the properties we rented from that point on. We didn't necessarily love every country in which we lived but the properties were as stated in each location. Without the necessity of making budgetary adjustments for this reasonably priced property, we're both pleased and relieved to have this portion of our travels settled and awaiting our arrival in only one year, two months and twelve days. When we think of it this way, its really not that far away. (We use an online app to calculate "dates between dates" which we need to calculate. Click here to see the free app. Undoubtedly, there's a risk in renting properties we've never seen in person. 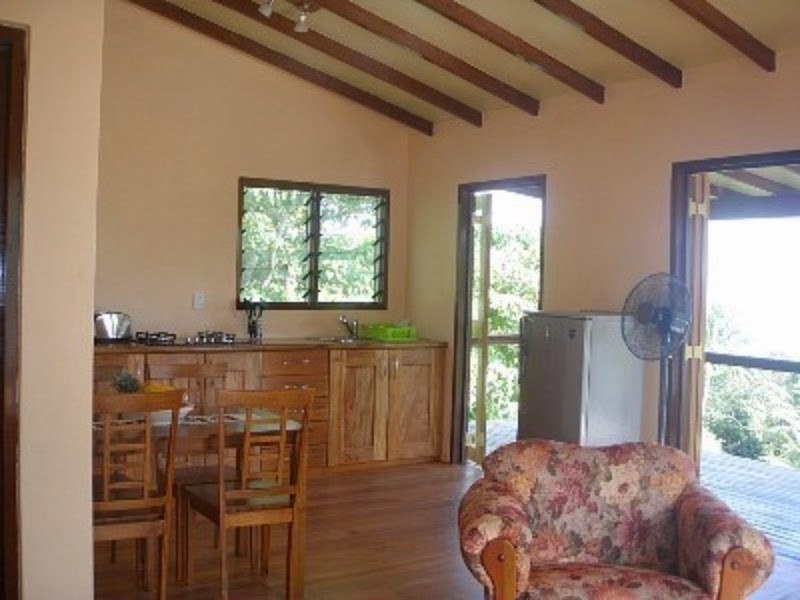 But, we've found that if the property is clean with a great view, with working WiFi and utilities, a comfortable bed, sofa and dining space and has a reasonably functional kitchen, we can get through it, bugs and all. Steps from the lobby of the resort down to the pool. Goodness, in South Africa, we had insects the size of one's hand, a spitting cobra on the veranda and scary looking creatures flying and crawling into the house. Somehow, we managed rather well. In many ways, adapting to a new environment every few months has made us more tolerant than either of us had ever expected. We've adopted an attitude that if we can't readily change a difficult situation, that no whining is allowed. Taking whining and complaining out of the equation greatly adds to one's ability to adapt and to ultimately have a good experience. in the 300 year old vacation home we rented in Boveglio, Italy for 75 days. It was part of the grouping as shown above in this photo. For details from that day, please click here. Further exploration on the island of Madeira! Photos! It was surprising how much cactus there on Miradouro referred to as a promontory. Yesterday, while Judite was cleaning the house, we decided to get out of her way. We've never liked hanging around when the cleaning person is there when it feels that we're in the way. Needing to purchase more meat from the little market with the expert butcher, we decided to tour the more remote areas of the island we'd yet to see, ending up our day at the market. When we first saw this jutting promontory, we knew we had to make our way to the top. We left cash for Judite's services, US $27.23, EU $20 for four hours of housecleaning, explaining with hand signals that she lock the door when she was done. Off we went on our way, not to return until she'd be long gone. When we saw this sign, we knew we for in for a treat. As time marches on, Tom's become a less jerky stick shift driver on these steep hills and I've acclimated to the remaining jerkiness, no longer feeling queasy. As a result, driving on these steep winding roads with frequent hairpin turns and cliffs with no guardrail has become easy, rarely feeling fearful or anxious. Unfortunately, it was cloudy and rainy. We hope to return on a clear day. It's funny how it was only a year ago in Italy when I cringed every time we drove anywhere. I think back to my pointless angst over the four hour road in Belize, flying in the little plane to and from the Masai Mara while going on safari and the steep roads in Italy. I chuckle to myself over how much I've changed! Miradouro is a promontory, a piece of high elevation land that juts out into the sea. Finding one's way around the island, as I've mentioned is challenging when searching for a specific address. Driving for pleasure with no destination in mind is easy. If we can see the ocean, we're never too far from the main motorway that surrounds the island. We walked out to the end of the promontory. Each time we take such a drive, we choose a new road to follow. Tom's great sense of direction and our combined good sense of remembering where we've already traveled, enables us to make new discoveries each time we're exploring. This is the end of the point of Miradouro. There was no guard rail and the terrain was uneven and rocky. We stayed as far away as we could from the edges but did move in closer a few times for photos. Whether it's scenery, goats, chickens, birds or dogs, our eyes are always peeled for the next photo worthy scene. It's ironic how our desire to post interesting (we hope) and appealing photos here each day, has made both of us more in tune with checking out our surroundings with an intense eagle eye. This was the view from the right side of Miradouro. We laughed when we realized after all the time we'd been driving, that below us was the village in Riberira Brava where we go to dinner and shop at the supermarket. The view from the left side of Miradouro. Of course, each person's perspective of what is interesting is different. As we walked a popular tourist spot we stumbled upon yesterday, I mentioned to Tom how ironic it is that he expresses considerable interest in vegetation, which he ignored in our old lives. I didn't intend to include this cactus paddle in this photo. Over these past 20 months since leaving Minnesota, the acuity with which we observe our surroundings has changed dramatically. In a large part, we credit writing here each day. Its a huge motivator. If we were traveling with the same intent as most tourists, we'd take our zillions of photos and leave it at that, hoping one day to bore our family and friends with our thousands of photos. The above flowers were growing on this tree. Instead, we can bore our family, friends and readers from all over the world, one day at a time or for some, we can brighten their day in a small way as we share the treasures of this magical world in which all of us live, in photos and stories. These unusual flowers hung from the above short tree. Once again, dear readers, we say thank you... for sharing this journey with us, for your willingness in reading our frequent mindless drivel of the mundane aspects of daily life and for making us feel that you are always at our side. At the moment, the excitement escalates for as we continue with bookings in the South Pacific, aka Oceania, all the way to May 16, 2016. Photos coming out this weekend. This was the road that we walked in our neighborhood in Boveglio, Tuscany, Italy in order to go the popular local bar, Bar Ferrari. Not quite as steep as the hills in Madeira but it certainly was good exercise as our the streets in Madeira, steep, steep, steep. For details of that day, please click here. The blooming season for flowers is fading at this time of the season. Although, it may seem as if we've been searching for a home in Australia for only a short period, over the past month we actually spent many days wrapped up in intense research. There are literally tens of thousand of listings throughout Australia on numerous vacation rental websites. With the poor real estate market worldwide, many frustrated homeowners have turned their homes that didn't sell into vacation homes listing them with one or more of the many vacation rental sites. 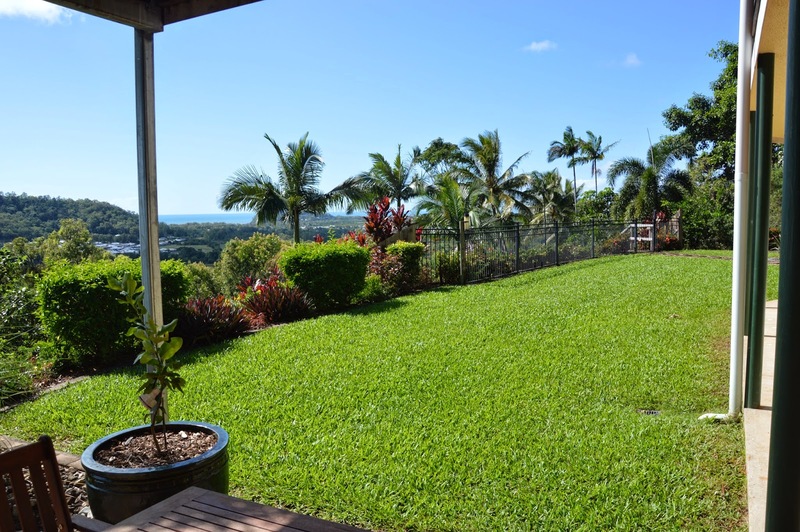 With our cruise ship at sea for 18 days sailing from Oahu, Hawaii to Sydney, Australia in less than a year, arriving on June 11, 2015, we've been determined to find an affordable home with an ocean view in what appears to be a very expensive Australia. 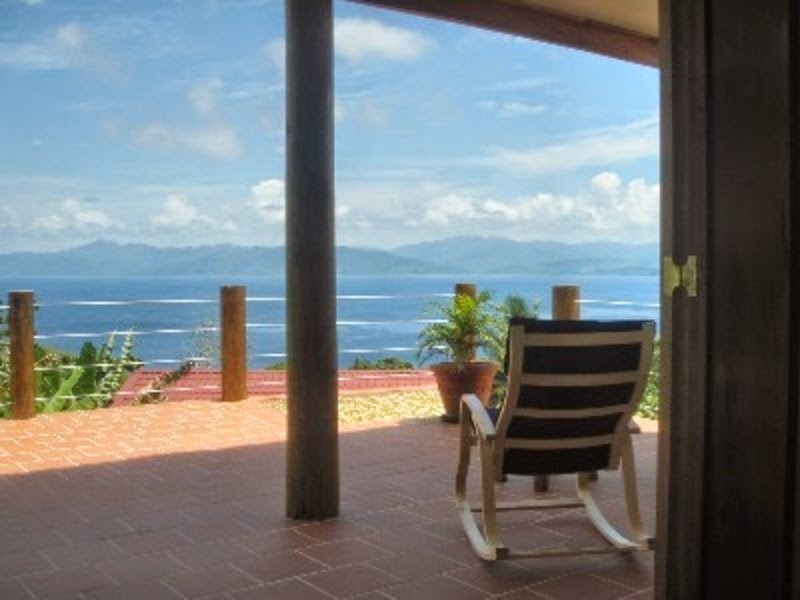 Most homes on the island have a view or a partial view of the ocean. Not having a home booked a year out can be cause for concern when one has no home at all. By no means, do we panic. Knowing that we have a place to live in a year definitely provides a degree of peace of mind. I realized I've mentioned this in the past but, some of our readers have inquired as to why we book properties so far in advance. Why not "wing it?" For us, the answer is clear: Would you wait to book a long term holiday/vacation at the last minute expecting to get what you want, where you want, during the season you want and for a price you want? Probably not. That's our reason. Plain and simple. Is this a papaya tree? As we peruse properties booked on owner's calendars, often kept up to date on the various websites, its easy to see how quickly the properties are snapped up. Waiting until a few months prior to the time we'd need it, results in slim pickings and overpriced "leftovers." Even in this poor economy, people are still traveling. Over the past few days we've begun the process of firming up rental agreements, paying deposits and logging all the information on our spreadsheets, backing everything up on the cloud, the hard drive and both computers...one means of back after another. A scene from our veranda at sunset. By the end of this week, we'll be booked out all the way to March 4, 2016 which sounds like a long way out but its in only 21 months, about the same amount of time since we left Minnesota. Some vacation rentals require payment in for the entire rental period, others require half and a few are content with a small token amount deposit. Since at this time, we're booking for almost a year beginning in June, 2015, the outlay is more than we would have liked at this time. Another view from the cliffs. Of course, once we arrive at each location, it's satisfying to be paid up but then, we begin paying deposits on future homes so it's all a wash. The odd part is paying one's rent a year in advance is required as we travel. Its not easy to identify some of the unfamiliar vegetation when we can't ask find anyone to ask that speaks English. It is imperative to pay deposits and balances using a credit card. If one of the rentals proves to be a scam, at least with a credit card, there is some means of recourse. Some property manager/owners require wire transfers of which we'd done a few in the beginning of booking our travels but no longer do under any circumstances. We were lucky not to experience any issues as a result of doing this but, we've learned a valuable lesson. If a property owner has no means of by which we can use a credit card, we'll pay using PayPal. PayPal is simple. With one's own account linked to credit cards, PayPal's secure site, we simply send the payment to the manager's email address. Once they receive it they open their own PayPal account (easy), entering their bank account number and the routing number of their bank. Surely, these must be grapes. Once completed, the funds go directly into their bank account, available to them in approximately three to four days. Once we send the payment through PayPal, the funds are immediately charged to our credit card on file with PayPal. There are fees associated with PayPal. If the manager/owner has discounted the rent for us due to our long term rentals, we pay the fees. The house we booked in Trinity Beach, Australia is signed, sealed and delivered and had PayPal fees of US $98 which we gladly paid. A garden flourishing in the temperate weather and occasional rain. Although we'd ideally like to share our negotiated rental amount on each property, we only do this is we paid "full price" which is listed anyway, online at the link we post for the rental. 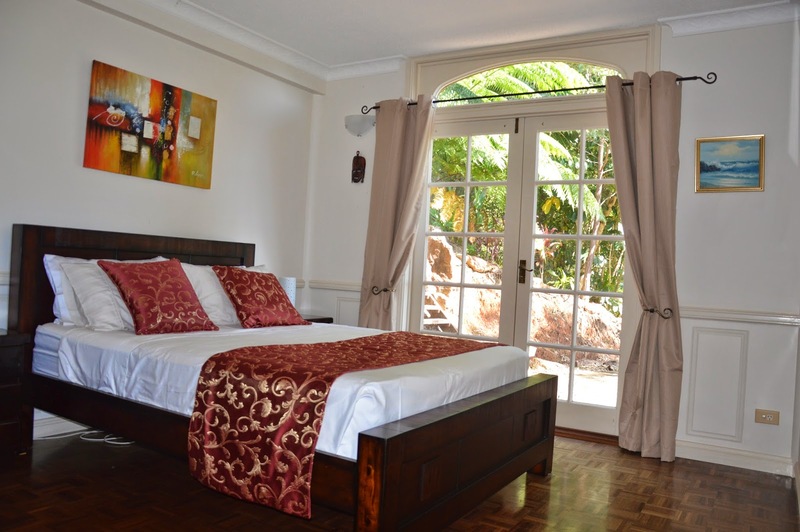 More times than not, we receive a good discount due to two factors: one, the length of our stay; two, the fact that we'll be promoting their property over and over again through our posts. With our readership fast approaching 200,000 worldwide, this can provide them with future rentals. A tiny house tucked away in the vegetation. If we were to post our discounted price, this may have bearing on the manager/owner future, shorter term rentals. If a prospective renter chooses to book it the property they may be expecting to pay the same amount that we negotiated based on these two unique factors. In any case, once we leave a property, we always post our total costs for our entire period while living in the rental including; the rent, the rental car or taxi fares, groceries, dining out, entertainment, tips, fees and taxes. If you're curious about any specific costs, please email me directly. I was so excited to see this cute kitten on our stone wall that I failed to hold the camera steady when taking what could have been adorable. Shucks! Please check back for photos and details of our future rentals over the next week or so, as we continue to wrap up details. We're very excited about finding these wonderful properties and equally excited to share them here with all of our readers! Last night when Tom came to bed his head hit the pillow and he said, "Safari luck!" I agreed, falling to sleep with a smile on my face. We took a road trip from our home in Boveglio to the village of Bagni de Lucca driving across this narrow bridge to the town's center. For details of the story with more photos, please click here. A drive in the mountains...Surprising finds!